This luxury look belongs in the master suite. 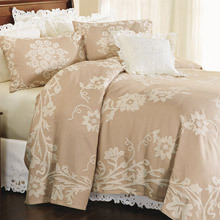 Our whisper soft bedspread is woven in a soothing, jacquard pattern in soft shades of taupe and cream. The thick, textured easy care cotton/ polyester blend has the elegant look of linen. Machine wash. Imported. Twin Bedspread 81" x 110"
Full Bedspread 96" x 110"
Queen Bedspread 102" x 118"
King Bedspread 120" x 118"